How Long Does it Take To Grow Wheatgrass In Different Seasons? 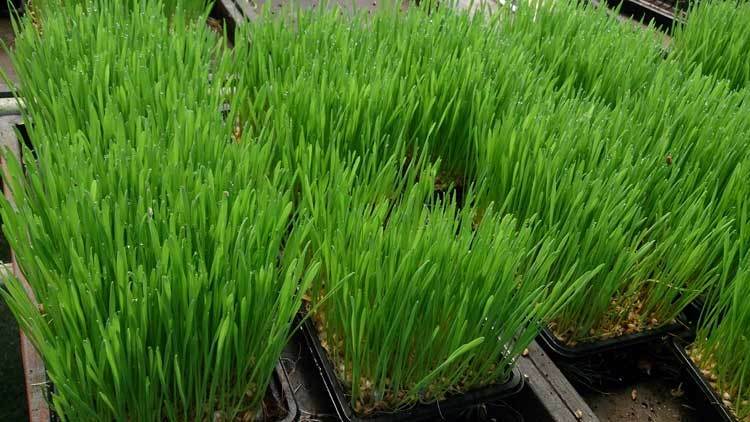 » How Long Does It Take To Grow Wheatgrass – What is germination time? How Do You Transplant an Orchid? How Long Does It Take To Grow Wheatgrass – What is germination time? How Long Does It Take For Wheat To Germinate? It Depends On Where You Live! When – And How Many Times Can You Cut Your Wheatgrass? Whether you're going indoors or outdoors (I bet that you really want to stay indoors with it in the winter time), you don't want to get it below sixty degrees. It's going to stop growing at that point basically). In the summer or springtime, when it's a bit warmer, you can expect your wheatgrass to go from dry seed to fully grown wheatgrass in about two weeks. But in the winter time, it could take up to 18 days. So, you can expect your wheatgrass to take about two weeks to grow from dry seed. However, if it is colder, it could take longer. Air-conditioning is a factor if you can use air-conditioned all the time. Try to keep it around 70 degrees (70 -75 degrees that would be great). If you can't, then you would want some circulation. You can grow it in Florida in the heat without air-conditioned (but make sure you have some air flow for air circulation). Once it starts to get too stagnant or too hot, then you're going to end up with problems. That's what people get a lot of mold problems whereas a big issue. 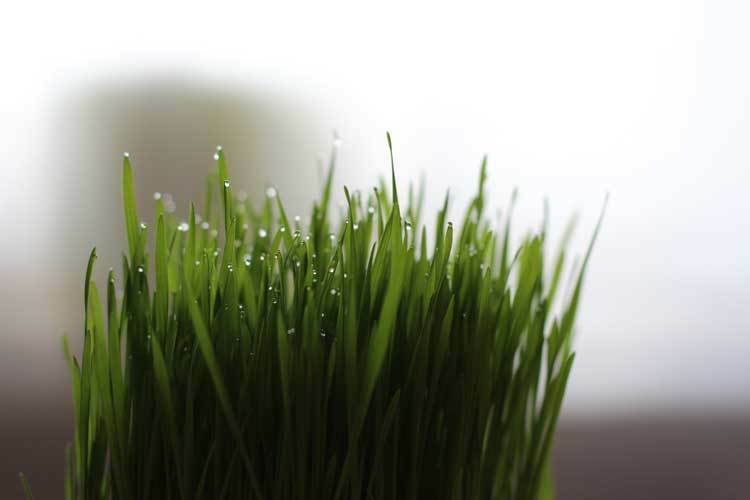 Wheatgrass normally takes 14 days to grow (2 weeks), but that's a that very varies because of the temperature. Wheatgrass germination is from 7 to 10 days (in kind of about 75-80 degrees) and then 10 to 14 days depending on 60 degrees 50 degrees. I think you really want to try to keep it between 60 and 80. So, 7 to 14 days is about average, and that's when you're going to harvest your wheatgrass. One of the questions I get asked the most which are when and how many times you can cut your wheatgrass? There is a way to kind of judge when it's fully grown by taking the blade of wheatgrass and peeling down, then seeing if there are two leaves. But in this case, I'm just going to go based on the height just before it starts falling over. Obviously, they have different heights after they have been cut twice and grown again. If you keep regrowing the grass after the cut, It’ll actually grow slower each time you grow it back. Specifically, when it hasn't been cut at all, it has the darkest luscious green. Then it gets a little bit yellow. And then it gets a little bit yellow still and also it gets coarser. So each time you regrow the wheatgrass, the quality of the juice declines and actually the quantity of juice you get out of it declines as well. So I only grow my wheatgrass a maximum and cut it a maximum of 3 times. And then the third cut: the juice is paler again and the flavor has started to decline as well. After the third cut on wheatgrass, there‘ll no blueprint, and you can see it's turning kind of yellowish-brownish. And it‘ll not work bothering with anymore. 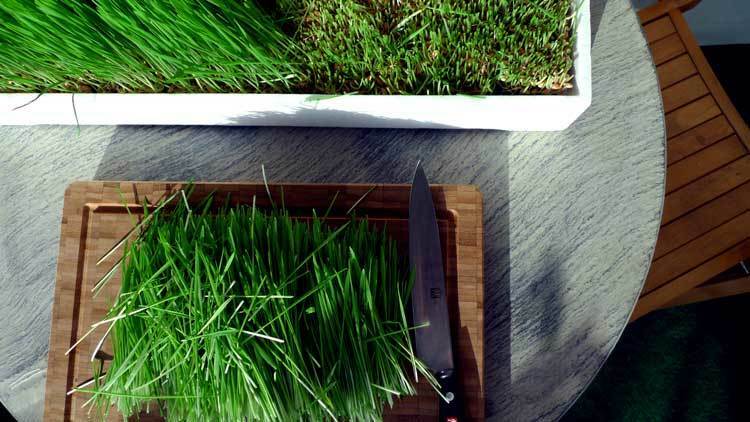 After the first cut on wheatgrass, you're going to only get maybe two cuts, possibly three out of it before it replant and recede, and start over again with new soil. What if I tell you I could really grow a lot longer wheat grass and cut them upwards of even five or even seven times. Some little surprise here is the clover. You can use clover mixed with the wheatgrass in the pot. You roll a little clover on the side; the clover will put nitrogen back into the soil. So the wheatgrass which has a lot of nitrogen and it puts the nutrients back into the soil. In this way, your wheatgrass will grow thicker, much healthier and it makes a greener with the clover. Now If you use clover mixed in with the wheatgrass, you'll get actually four or five cuttings out of it, even in a flat if you use the right amount of clover. But I like to use pots because the roots can go deeper get more nutrients in them and it tends to look a lot healthier. So for juicing generally speaking, if you're going to use a high pot about 12 inches, you're going to get probably three to four cuttings on it, maybe even a little more. But if you use clover, you can get upwards of seven or eight times. So that's our session where you have: how many cuttings you can get out of wheatgrass (with and without the clover) and how long does it take to grow wheatgrass. I hope that's helped you to answer your question about growing wheatgrass and making wonderful wheatgrass juice to improve your health, improve your immune system and make you feel better. Also, remember that the first cut is the best by far. The second cut still pretty good. On the third cut, the quality is starting to decline, and I don't think it's really worth growing after that point. Thank you for reading. Like and share if you like it. How Long Does It Take Grass To Grow – Are You Willing To Wait? What Is The Best Indoor Bonsai Tree For Beginners? HappyyGarden.com is a participant in the Amazon Services LLC Associates Program, an affiliate advertising program designed to provide a means for sites to earn advertising fees by advertising and linking to Amazon.com. *Amazon and the Amazon logo are trademarks of Amazon.com, Inc., or its affiliates. Additionally, HappyyGarden.com participates in various other affiliate programs, and we sometimes get a commission through purchases made through our links. Copyright text 2018 by HappyyGarden - A Garden Blog.